Who is the responsible authority in Gabon for implementing these regulations? Which products are subject to the conformity assessment? Who is responsible for obtaining the certificate under the PROGEC programme? Can the PROGEC Compliance verification procedure be initiated by the importer? What will be requested by Gabon Customs? How will the importer receive the Certificates? Who else receives a copy of the certificates? How often can the CoC be issued? 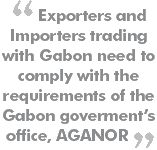 How are goods arriving in Gabon without the Certificate of Conformity handled by AGANOR & Customs? What happens if the product fails the Quality Compliance Verification? What is validity period of the PROGEC field inspection reports? What is validity period of the CoC? Can PROGEC Agent issue Certificate of Conformity (CoC) after successful quality verification despite any quantity discrepancies? 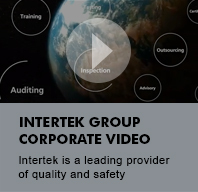 Can Intertek inspect in all regions and countries in the world and also guarantee a 3-day T/A time to organize and execute inspections? Is container sealing during inspection and witnessing of the loading process required for shipments exported to Gabon? Can markings be present only on the shipping carton? Can a product be shipped if the marking on the product is not in French language? Are there any minimum shelf-life requirements for products with limited validity? Are French manuals mandatory for shipments? Can electric/electrical products be certified without plug? Are goods sourced from manufacturing plant that are ISO 9001: 2001 or other QMS certified manufacturer subject to certification under PROGEC? How does AGANOR/Intertek treat second hand motor Vehicles without a certificate of roadworthiness at the time of inspection? What happens during PROGEC certification process in situations where there are no relevant Gabon Standards? What is the fee applied for quoting shipment certification services? Who is paying for the certification? Are goods shipped by express courier (e.g. DHL) and courier parcels subject to PROGEC? How will urgent shipments by Air be handled? Are medicines subject to certification? Are small consignments with values less than EUR 1,000 subject to PROGEC programme? Can shipments in transit be certified? How will Route A shipments be certified? How will Route B shipments be certified? How will Route C shipments be certified? PROGEC (Pre-Export Verification of Conformity) is a conformity assessment and verification procedure applied to all Goods/Products at the respective exporting countries, to ensure their compliance with local, international or regional standards and regulations. The programme also aims at health, safety and environmental protection, in addition to promoting quality products. The Gabonese Standard Body (AGANOR), a public administrative institution of the government of Gabon, is responsible for the adoption and application of Standards for both imported and domestically manufactured products in the Gabon market. Intertek has been appointed to carry out the PROGEC programme on behalf of AGANOR, operating in all countries of supply. Exporters are responsible for obtaining the CoC before shipping their goods to Gabon. The Exporters trigger the certification process by submitting the completed Request for Certification (RFC) application form to Intertek to the responsible Country Office in their region. The RFC form can be obtained from Intertek Country Office on request or on the internet website. PROGEC is an Exporter oriented program, where the Exporter initiates the process by contacting the nearby Intertek Country Office for inspection arrangements. However, the Importer can also initiate the process by contacting the responsible Gabon Intertek Office and submitting the Proforma Invoice and by providing the Exporter’s contact details. In addition to submitting Original B/L/AWB, Certificate of Origin, Commercial Invoice, packing list, etc. It will now be mandatory for the importer and clearing agents to present the original CoC together with the other documents. It will also become mandatory for the clearing agents to complete the information on-line on the Module BRK (in Sydonia) with the new CoC number in the relevant field. The Exporter will submit the CoC together with export documents. Importer can also receive the CoC directly by Intertek Gabon, but then this would need to be clearly advised by Exporter to Intertek. In addition to AGANOR, Gabon Customs will also receive electronic copies of CoC. CoC is issued per consignment/shipment. Goods arriving after August 2015 to Gabon without a CoC will be rejected for clearance. Intertek will notify the Exporter regarding the parameters that have caused the product to fail and advise the Exporter to initiate corrective measures, before a re-test is done. 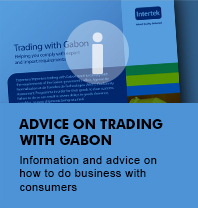 If the Exporter is not able to take corrective measure or if the corrective measures undertaken by the Exporter fail once again on retest, Intertek will have no choice but to issue a Non Conformance Report (NCR) which would indicate that the goods are not in compliance with the requirements of Gabon and as a consequence would not be permitted to be exported to Gabon. The validity period of the field inspection (physical inspection) report is 90 days i.e., the difference between the date of issuance of a CoC/NCR and the date of physical inspection should not be more than 90 days. The validity period of the CoC is 90 days from date of issuance. This means that the goods must be shipped and cleared within the validity period of the CoC. The details in the final invoice and the CoC should always match to avoid any issues at Customs. However, if such discrepancies are found this shall be disclosed by Intertek on the CoC. Yes. This is subject to Exporter providing all requisite documents and confirming payment of fees for inspection. Container sealing and witnessing of the loading is not mandatory but will be done when practically possible and if required/needed Intertek will witness loading and seal containers. Markings only on the shipping container/carton are not sufficient. Markings need to be present on each product and products’ packaging which is sold to the consumers. Products, which do not have essential markings (including Instructions where applicable) in French language, should be rejected. There are no such restrictions and as long as the product has the shelf-life marking it is acceptable. The pre-shipment inspection will also assure that the remaining shelf-life once arrived in Gabon is sufficient. Yes, French Manuals will be required for all products that require special instruction for end user application. Electrical appliances without plugs are not to be certified except in cases of stationary appliances which are normally hard wired into the household’s main supply. Yes, all goods must be certified under PROGEC regardless of the Quality Management System (QMS) status of the exporter/supplier. However goods sourced directly from ISO 9001:2001 or other QMS certified manufactures/distributors may not require rigorous certification process owing to their status. Such manufacturers or distributors are encouraged to seek certification under Route B or C so enjoy the advantages of the quality management systems. Second hand vehicles shipped without a certificate of roadworthiness won’t be accepted during inspection. The PROGEC programme has been designed to be as flexible as possible. Where there are no Gabon standards, PROGEC Agents are authorized to apply equivalent international standards, regional or national (of the exporting country) standards or manufacturers’ specifications in that order. The applicable Verification Fees depend on the Route, subject to the minimum and maximum detailed below. Note: The above fees are subject to a minimum of 300 Euros and a maximum of 7000 Euros. The Registration fees shall be 375 Euros, which will cover the Registration of 15 products /line items in the Statement of Registration (SoR). Every additional product/line item above 15 products/line items will be charged an additional fee of 20 Euros. Amendments to SoRs will be charged at the rate of 40 Euros minimum for up two products /line items amendments and then 20 Euros per line item amendment after that. Licensing fees are calculated on a case-by-case basis. Please contact your nearest Registration and Licensing Certification Centre or Intertek Country Office for further information. Note: Products with common characteristics will be grouped together in determining the Registration/Licence Fees. The Exporters and/or manufacturers are responsible to ensure that their products are compliant tor the Gabon market and thus are responsible for paying the certification services. The Gabon Importers do not pay for this service. No, such shipments will be exempted. Certificates of Conformity (Coc) for urgent Air Shipments will be issued as soon as the inspection is completed. CoC for such shipments would be certified on the basis of the Proforma Invoice if the Final Invoice is not available at the time of CoC issuance. Yes, small consignments with FOB value less than EUR 1,000 are not exempted. Shipments in transit will not be certified. Products certified under Route A will need to show proof of testing (through valid test documentation). If this is not available, samples will be picked for testing from the consignment. On successful testing and inspection of the consignment, the CoC will be issued. Note: In cases where ready test reports are submitted by the Exporter who is also a regular shipper, they should be advised to take up Route B (as long as the products do not come under the list of compulsory Route A products). Route B shipments will be certified based on random testing and inspection. Consideration will also be given to the frequency of shipments, nature of the product and its risk factor. Route C shipments will be certified based on random physical inspection and verification of the License. Licensing of products under Route C involves a review of analytical reports, accompanied by a full audit of the production site and follow up inspections to ensure that local requirements are systematically integrated into the manufacturing process. Approval procedures are in compliance with the Guide 28, ISO/IEC-Guidance on a third party certification system for products. Upon completing these stages, the manufacturers will be granted license for their products.